It is a sad truth universally recognized that there are just so many people less privileged than ourselves. And it’s heartbreaking to witness. Having travelled widely I still have no answer. To give generously and help or not to give. That is the question. So I’ll give you my answer and my suggestions and warnings. I have friends who volunteer to build houses for single women in countries where these poor women rely on occasional donations of rice for food and where their mud huts get washed away with each monsoon. 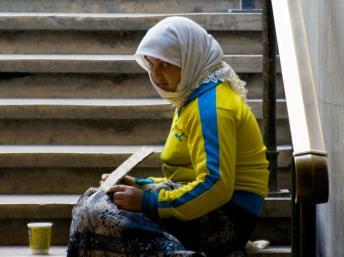 These women suffer from malnutrition, glaucoma, disease, broken families and broken hearts. My heart breaks even hearing their stories of suffering. Give give and give more to these poor wretched women I believe. But there are also flagrant scammers – who may indeed be impoverished compared to our Western affluence – but who play on our emotions, our milk of human kindness and our Christian sense of compassion to fleece us. And they can really sully your overseas holiday too. In April this year in Paris the staff of Le Louvre museum staged a walkout strike which closed the museum. Workers claim that thieves have been showing up at the museum in gangs of up to 30 — primarily made up of young under-aged Eastern Europeans — and are responsible for incidents of “spitting, insults, threats” and hitting employees and visitors. I have never experienced or witnessed this at all so don’t be alarmed. But it does require action. More police are definitely needed in the Louvre. 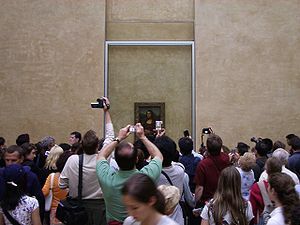 The problem is that European residents are allowed into most museums for free up to the age of 18 and these pickpockets see the 30,000 per day tourists taking iPhone photos of the Mona Lisa and strolling around the Louvre as rich pickings. 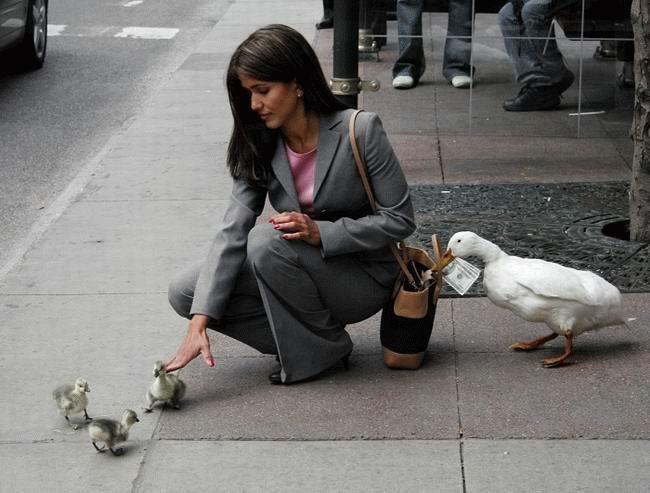 These are seasoned pickpockets who can make loads of cash from unsuspecting tourists. France has a great welfare and free health system which is now open to all European residents who enter their country. So, impoverished folk from Bulgaria, Rumania and other Eastern-Euro countries flock to the major cities and, having no hope of finding gainful employment seek to either beg from or fleece the tourists however they can. They are loosely called Gypsies and for wont of a better description I’ll use it here if you’ll forgive my possible political incorrectness. Of course there are other minority groups too who bother tourists and I’ll deal with their fund-raising activities too. I may seem harsh and bigoted. I can only be honest about how I see the situation in major cities like Paris, Rome, Barcelona (as I have spent a lots of time in all of them as a guide) and how I have kind of decided to respond to these people that salves my conscience – a bit. The Ring Scam. Lots of folk get suckered by this one. 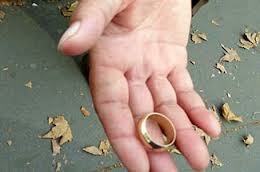 If a someone calls after you that you dropped your ring and they are returning it to you wave them away and keep walking. They intend to pick your pocket. What Do I do about the Beggars? Outside all churches and on steps in the metro there are the ubiquitous beggars with tins out or waving pitiful placards about being hungry. I am in no position to know if they are suffering genuinely or not but I believe begging is dehumanising, humiliating and soul-destroying for everyone. Give what you like but keep a certain scepticism about the genuineness of the appeal and whether you may be being manipulated to donate to someone who could be young and has made a career as a beggar or someone who needs money for alcohol etc….. who knows. Your call. I do not believe begging should ever be rewarded. Do something, offer something for a reward. Don’t just beg. Make something to sell – however paltry. Unless you are very obviously in dire need, too frail, handicapped etc to do anything for money, I try not to donate to beggars. Up in Montmartre is an asthmatic man in a wheelchair who makes tiny multi-coloured keyring dogs out of donated nylon all day long. He is always surrounded by people wanting to buy his key-rings. Good on him. 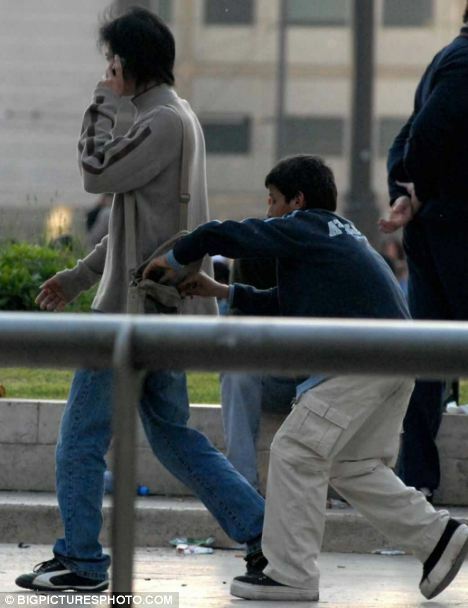 I disapprove of parents or kids who beg with their children in tow and I would never give to them. They can be particularly annoying as in this photo. 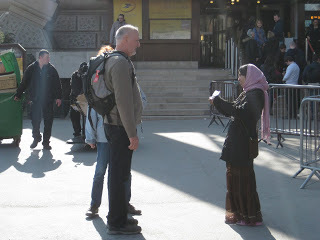 Groups of beggars and solicit-ers tend to set upon you around the monuments of the Louvre and Tuileries, Sacre Coeur etc. Wave them away firmly and they will eventually scatter to harass someone else. 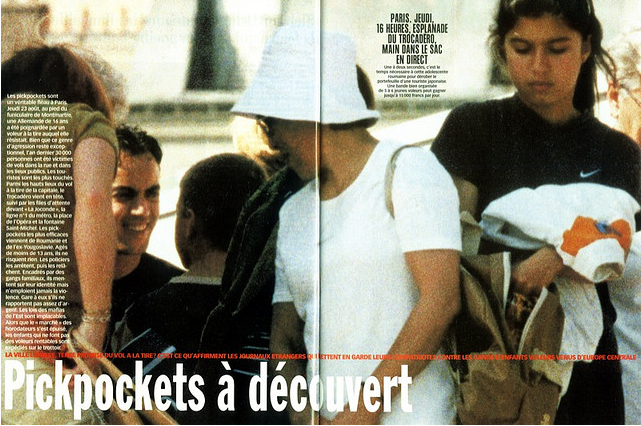 Line One Metro in Paris is the most popular tourist metro line and I have seen people “done over” by young pickpockets. As you can see in this picture, a single or couple of teens will get on the train same time as you do – throw a coat over your bag whilst they pickpocket it and then leap off the train just as the doors are shutting. Eiffel Tower – a mother and child squashed up against a gentleman in the lift. He thought his wallet was well hidden in his buttoned trouser pants. They got 700 euros cash. If you ever feel anyone pushing into you grab all your belongings tight and turn on them. 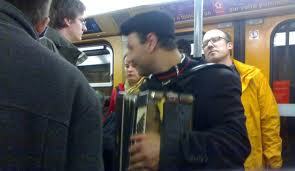 Metro Buskers – they are working for their cash. Give them some coins if you enjoyed the music they played. They are working hard for it I reckon and often it adds to the trip if you have something to listen to. Give them 30 or 40 centimes or more maybe is my suggestion. Petitioners with Clipboards – these are often groups of black men who mob you earnestly to sign a petition for “freedom in Africa” or some such nonsense and then – ask you for a donation. Don’t waste your time. Be polite but firm. Deaf Beggars – please give to me she signals with her hands – because I am “deaf” and therefore “mute”. Wave them off politely but firmly. 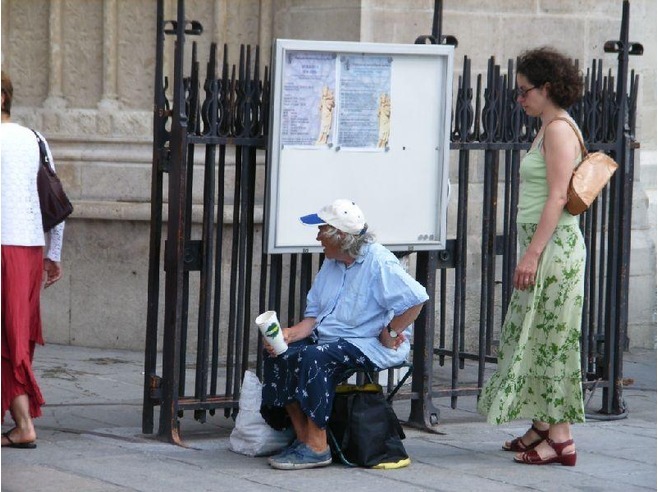 Beggars who solicit you with Cards – exhorting you to stop and read about their woe is another trick to either pick your pockets or shame you into donating cash to them. Same as above. Walk on. 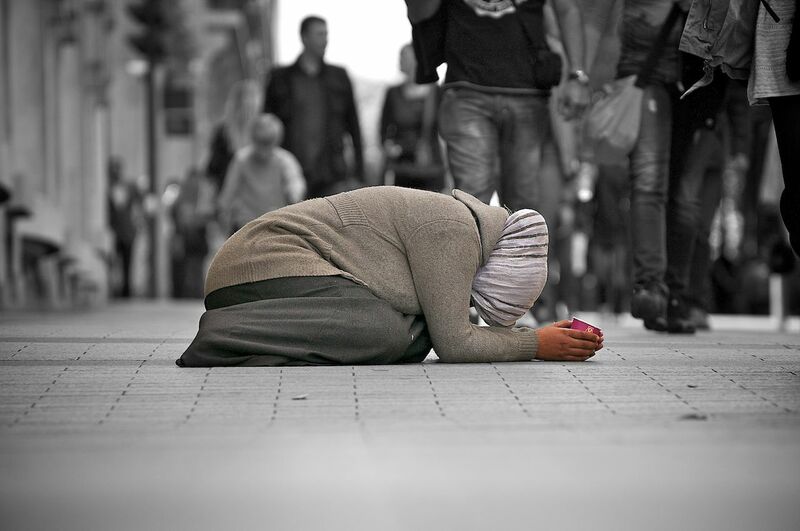 This image of the deliberately miserable abject gypsy prostrate on the street (often outside Louis Vuitton as here) is a universal problem – I just don’t know the answer. She wants to shame and appall you as you exit Louis V with your $2,000 handbag! Walk on. They are not doing anything to earn their money. They may be destitute. They may actually be reasonably well-fed and in an impoverished community who all pools their earnings. I don’t know but I am very sure the Parisian government wants this begging discouraged. 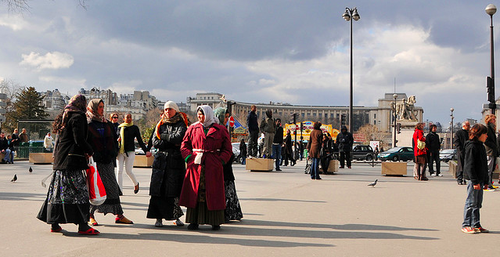 Less tourists in Paris because of theft or too many beggars around the streets means less revenue for France. Enjoy your holiday and zip your bag, wear a money belt and maintain a healthy scepticism for when you think you may be being “had”. Trust your conscience and give when you think you see genuine need and not just institutionalised begging practised among some groups as a source of revenue from their young or a way of getting quick cash. Yep, I got suckered by the deaf mute routine, to the tune of 20 euro, but managed to fend off the ring guy(s). I was pretty cranky at first, but eventually wrote it off as a tax on naivety. Well said. There is ALWAYS an alternative to begging! Worldwide! The problem is getting out of hand, worsening every time I go ..
You may have wondered why a lot of beggars have dogs ? It’s insurance, cops can’t take them in coz they can’t take care/have facilities for the dogs. Another form of trying to endear you but exploitation of animals..
A problem which seems to be getting worse in a lot of big European cities unfortunately. A sad reflection on humanity ….but true! If you feel bad and almost have a moment of weakness, just remember that when you give money, you get to leave and go back home. But by giving money, you make it worse for Parisians who actually live there must deal with this every day. This is a really valid point SavvySearch. There is just no good answer to this. if you give, it salves your conscience but it also has ramifications for Parisians who live every day with it.